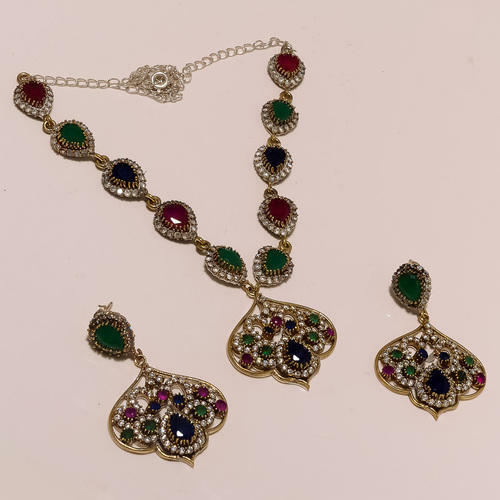 We are a leading manufacturer and exporter of Attractive Turkish Trending Necklace Set. Established in the year 2008, My Silver Shop, enlisted among the prominent Manufacturer, Exporter, Wholesaler and Retailer of a vast variety of Bezel Jewellery, Victorian Jewellery, Pendant Ring Set and much more. Our product line is trusted and admired by the clients based across the globe for its premium quality and salient features. We incorporate only high-grade materials in our production process to deliver highly reliable products in the market. Our valued clients can avail these products from us at industry leading prices. We also provide these products to our esteemed clients in customized form as per their precise needs and demands. Our assiduous team of qualified and talented professionals enables us to design and present an immaculate product line in the market. The manufacturing unit of our company is operational with hi-tech machines and equipment. Our entire product line is quality tested and meets world-class standards. We also ensure that all the products are delivered to the clients within the committed time frame.